The acronym BIM refers to Building information Systems and is defined by Autodesk as an intelligent 3d model-based process that gives architecture, engineering and construction professionals the insight and tools to more efficiently plan, design, construct and manage buildings and infrastructure.What does BIM design and HVAC Estimating have in common and what are the potential advantages? In most cases files generated in Autodesk Revit and other Autodesk construction products have the potential to be exported to estimating platforms and the data may be used to facilitate the takeoff process. Wendes Estimating Software offers this potential however, the file format of data with both systems must be aligned. In other word the description of pipes, valves, duct, accessories etc. within both systems should be the same. While there are set up requirements involved with the alignment of data between both systems the potential for both BIM design and estimating systems to share information offers an opportunity for sharing labor and cost information. 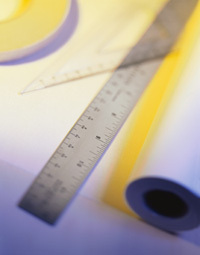 BIM -Building Information Modeling Is a computer aided process for developing building data during the construction design and building life cycle. BIM software contains elements of a building design as individual objects that include the geometry and attributes in the building design. BIM software design tools provide the ability to extract many different views of an object in a building model that may be relevant for other uses in the drawing process or downstream construction process. BIM software deploys three dimensional real time modeling software tools to increase productivity in building design and construction.Most BIM software includes detailed attributes of the building geometry,spatial relationships of objects, object quantities, object properties and building components which eliminate uncertainty about detailed elements of the building design during the construction phase. BIM software provides a "parametric definition" which describes each object and relationship of each object to other objects, as one object is changed other objects will change as well. The connectivity of objects insures that the integrity of the building design is not corrupted as changes are made. To learn more about BIM and MEP Software contact Autodesk, a leading provider of software in this field. Wendes Systems is working closely with BIM software providers to intigrate HVAC Sheet and Mechanical estimating with BIM and MEP software in order to produce better results. New technology in HVAC Estimating Software for On-Screen Takeoff has enabled estimators to streamline the bidding process and collaborate on projects. It has helped in creating a paperless environment with greater access to project history. Wendes HVAC Estimating Software and Screen Takeoff is further enhanced with BlueBeam Revu PDF file conversion, Markup and drawing overlay. As drawing files are modified throughout the construction process it becomes essential to track projects and capture changes as they occur. BlueBeam Software allows the entire team to access and share drawing files to Markup changes and overlay modifications to highlight the changes in systems on the fly. Change orders may be calculated and displayed in alternate colors to visually display differences. 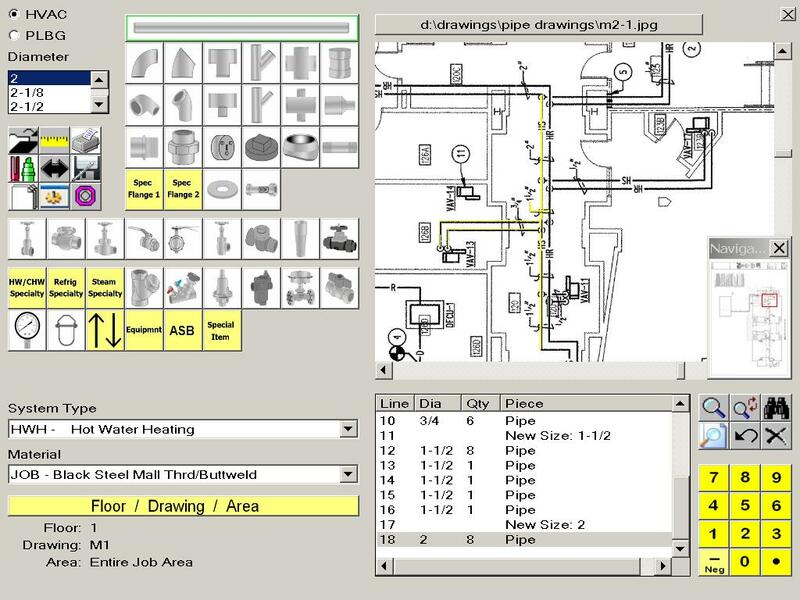 On-Screen HVAC Estimating takeoff software eliminates the need for paper drawings by converting digital drawing files for on screen viewing and marking. 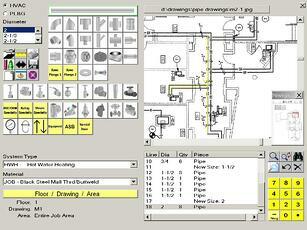 The estimator is able to takeoff linear duct and pipe, fitting quantities, accessories, components, mark and color drawings, scale drawing, takeoff multiple pages of a drawing file and view specific floors, areas with a click of a computer mouse. On-Screen Takeoff provides an easy to use template and Screen Icons that perform all of the functions that would ordinarily be used with Digitizer Paper Takeoff. 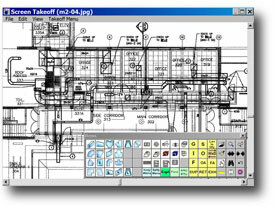 All of the information gathered during On-Screen Takeoff is included in the HVAC Estimating Software and provides detailed takeoff data containing; Linear Duct/Pipe quantities, DUCT/Pipe Fitting quntities, Accessory Items, Labor Calculations, Material Quantities, Material Pricing and extensive detailed management concerning the systems takeoff. On-Screen Takeoff viewing is provided on a single monitor or dual monitor. 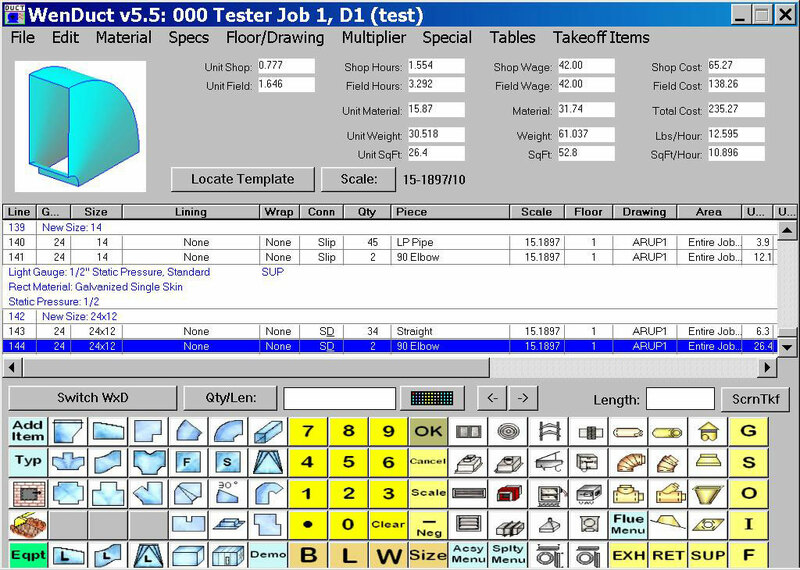 In most cases one monitor displays takeoff information, templates and icons and the second monitor is used for display of the elctronic drawing file. After completion of an On-Screen Takeoff markings and other information concerning the takeoff is preserved in an electronic file for future reference. To learn more about the many advantages and productivity gains with On-Screen HVAC Estimating Takeoff Software contat Wendes Systems for a web presentation and download a free trial of BlueBeam Software.